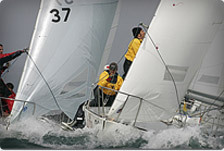 Light winds dominated the first races of the J/24 championships. The key to success was to find free winds and to sail the boat as smooth as possible. Fumiya Kato (JPN 4886) showed the greatest skills on the water. He is on top of the leaderboard after 2 races, followed by Ian Southworth (GBR 5219) and Ignazio Bonanno (ITA 416). Not only the crews, also the Principal Race Officer had to find the right wind to get the fleet of 56 participants under way. After a short postponement, the first race of the J/24 worlds was started at 14:00 hrs in the bay of Boltenhagen. In very light wind conditions (5 to 10 knots from NW), Team “Rotoman” (GER 5420) helmed by Tobias Feuerherdt won the first race. In the second race of the day, the J/24 class showed their favour for very aggressive starts. After 2 general recalls, PRO Klaus Lahme raised the black flag. The second race was also won by a German team: “Hungriger Wolf” (GER 5316) helmed by Johann Huhn took the line honours. Overall, the Japanese crew “Lull & Hachi” with helmsman Fumiya Kato (JPN 4886) did a great job on the water. With a second and a third place, the crew of 6 are on top of the fleet, divided by a gap of 7 points from Ian Southworth (GBR 5219). After a hot and sunny day on the water, the crews are enjoying Caribbean flair at the Mount Gay beach party organized by the German Sail maker “Clown Sails”. First warning on Tuesday will be on 12:00 hrs. It was in 1976 when US Sailor Rodney S. Johnstone constructed a simple, cheap and fast boat for his son in his garage. Today, the J/24 is the biggest keel boat class in the world. Its strict class rules keep racing simple and affordable even for youth teams, and one design makes competition even more fun. Many successful sailors began their career in J/24, such as Ken Read (Skipper in several Volvo Ocean Race-campaigns), silver medallist and America´s Cup tactician John Kostecki as well as America´s Cup winner Ed Baird. All footage is free for editorial use. Please use “Pepe Hartmann/J/24 worlds” as a credit. 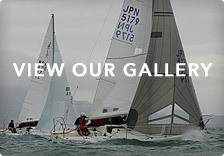 Video footage for embedding on your website or Facebook fan Page can be found on www.facebook.com/j24worlds2015.